When I came out west I started on a Quest for the best Trainwreck cutting I could find. I was not impressed with the Arcata cutting as it was too tall to slow and to bi-sexual for my taste. I had written off this legendary strain until I came across an amazing plant discovered by Smokescreen. Found inside a bag of Dank of the few seeds found one female exhibited all the traits of the famous wreck without producing a single male stamen even late into budding. The complex late coloring is a thing of beauty and the potency of this mother is epic. Extremely potent smoking just a few bowls is an adventure in repertory failure and flat-lining your brain waves. We decided to combine this incredible female with the genetics of Jack the Ripper. 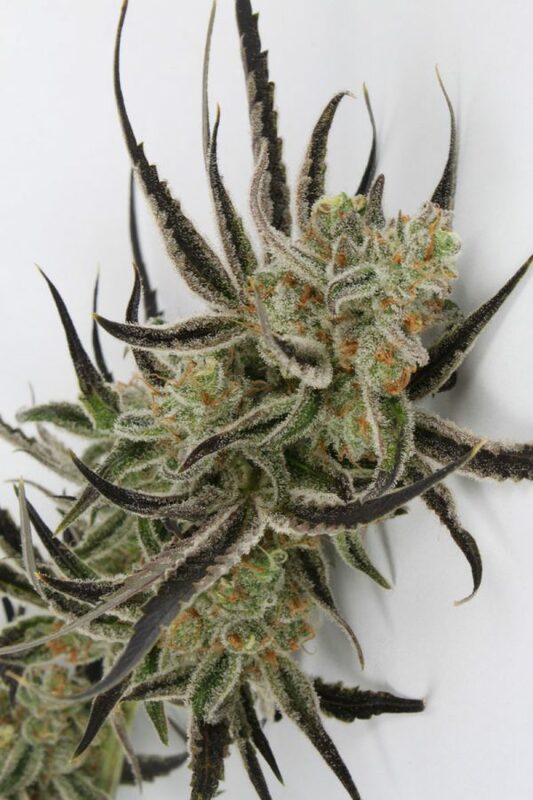 This strain produces large towering colas that are encrusted in crystals. Chernobyl is another of our color changing strains which produce stacked trichomes and copious amounts of resin. The taste is a combination of sweet and sour with a lime Slurpee undertone and earthy overtone. Slymer and The Golden Ticket came from this line! Height: Tall spears that form multi-headed towers.